Step 2 Heat oil and garlic in a small saucepan over medium-high heat until the garlic begins to sizzle, about 1 minute. Remove from heat and set aside. Step 3 Slice tomatoes, onions, squash and zucchini into ⅛-inch-thick slices. 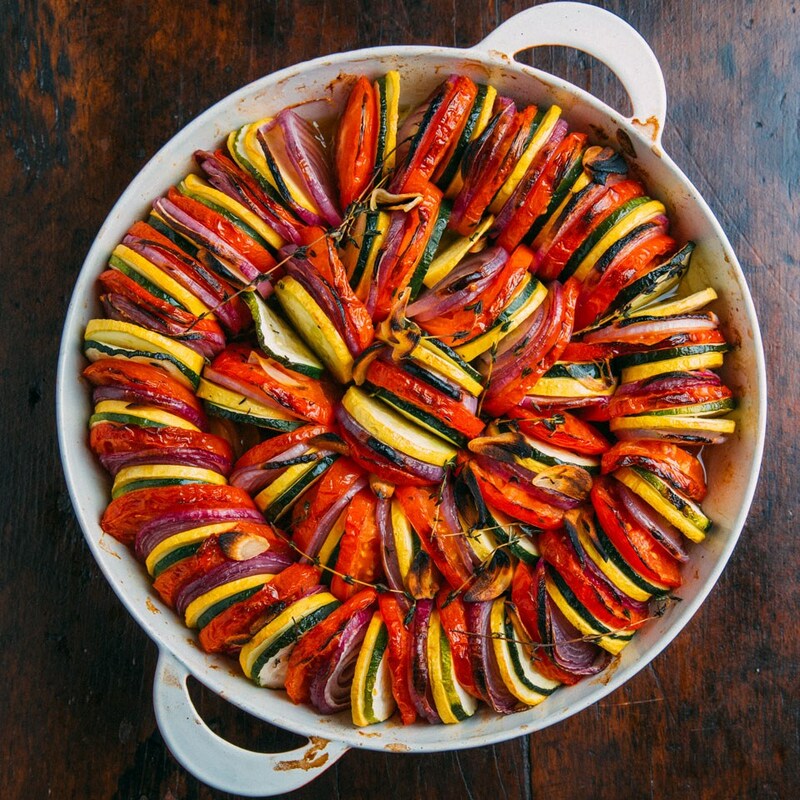 Standing them up on their sides, alternate the tomato, onion, squash and zucchini slices in a circular pattern around the edge of a 9-inch deep-dish glass pie pan or similar-size round casserole dish. Make a second alternating circle in the center. Pack the vegetables tightly: they will shrink while baking. Step 4 Discard the garlic, if desired, and drizzle the vegetables with the oil. Sprinkle with salt. Bake until the vegetables are tender and starting to brown, about 1 hour. Let cool for 10 minutes before serving. This pretty vegan layered casserole is so simple to make. Its only seasonings are salt and garlic-infused olive oil, which you make by sizzling a clove of garlic in olive oil for about a minute. This dish is lovely warm or room temperature. Serve with crusty bread as a vegetarian entree or alongside roasted meats as a side dish—don't forget a glass of chilled rosé.